Badami is a small town in Bagalkot District of Karnataka state of India with a population of 32000 (in 2016). Badami, a capital city during the Chalukyan era in 6th century, is a renowned tourist destination in Karnataka because of its Cave Temples. Mesmerizing natural landscapes, rocky terrain, intricate carvings in cave temples, vibrant life in the older core of the settlement lends the place a unique character. Badami is well connected by rail and road transport. Badami railway station is located at a distance of 5 kilometres from the town of Badami, trains from major cities regularly halt at this station. In order to reach Badami town from Badami railay station, visitors can hire rickshaws or hop onto the bus. However if direct trains are not available, Hubli(100km) and Bijapur(120km) are the major stations nearby from Badami. The bus stand is situated at the center of the town. Buses from Gadag, Bijapur and Hospet also halt at the town. One can also take a bus to Badami from Belgaum, Bengaluru, and Hubli. 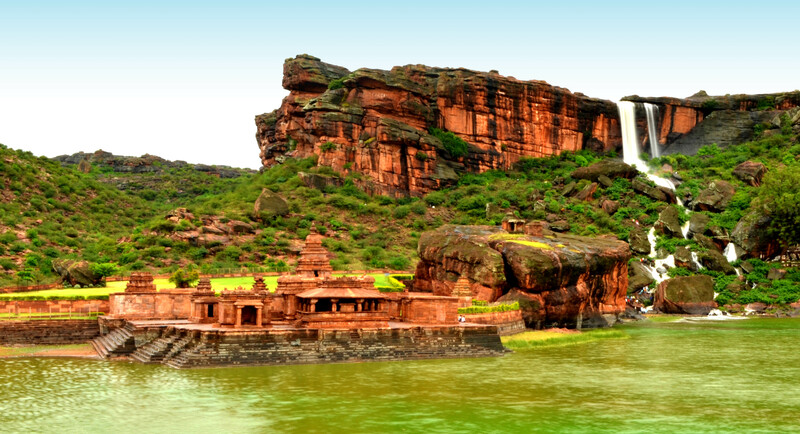 Apart from the thrilling rock climbing, Badami showcases the origin of temple architecture of India. The cave temples of Badami being the most famous and followed by Bhootanatha group of temples and sculptures around the Agastya theertha tank, North and south forts, sidilpada prehistoric rock painting site, the vibrant life in the historic town of Badami. The world heritage site of Pattadakal is 18km from Badami. “It is one of the most ancient places of Karnataka state. Badami is situated in an area surrounded by two red sandstone hills geologically known as ‘Badami cists’ having natural protection. It is located in the Mahaprabha valley a little away from the river. In and around Badami a few prehistoric sites ranging from Paleolithic period to Megalithic period were reported. Badami is mentioned in ancient inscription as ‘Vatapi’ or ‘Badavi’. The Egyptian geographer Ptolemy in his ‘A Guide to Geography’ has a reference to a people called ‘Badaiamaioi’, which may be a trace of Badami. During early historic period the area was in the domain of Mayuras and later on passed on to the Satavahanas and then to Kadambas. Attracted by the scenic beauty and natural defense of majestic hills, the Chalukya monarch Pulikeshi-I (543-566 AD), established an independent kingdom, and made badami, the capital of the early Chalukya dynasty. A stepped tank bund was constructed across the ‘U’ shaped valley joining the northern and the ssouthern hill. It converted the valley into a reservoir, known as Agastyatirtha. It became a lasting source of water for the newly established capital city. Major efforts were undertaken for building fortification for the defense of the capital city, and the achievement is declared in an inscription carved high on a rock wall, at a place behind the museum, difficult to access. Under royal patronage, four rock-cut caves of Bramhanical, Buddhist and jaina religion, were carved into the southern hill and three structural temples in south Indian style were constructed in the northern hill. The cave –III has an inscription dated 578AD, which mention the regent king Mangalesha as the patron. Pulikesha-II (610-642 AD) led a campaign to south India and attacked the king of Kanchipuram (Tamilnadu). In the northern Indian Campaign, he defeated king Harshavardhana of Kannauj and captured area upto Narmada River (Maharashtra). He made his brother Vishnuvardhana, also known as Khubja- Vishnuvardhana as the governor for the eastern territory, which later became the dynasty of Chalukyas of Vengi, in Andhra Pradesh. His last brother, Dharashraya- Jayashimha, established the kingdom of the Chalukyas of Gujarat. King Narasimhavarma-I of pallava dynasty of Tamilnadu, to avenge his defeat, attacked and occupied badami (642-655 AD). His exploits are declared in an inscription carved on the surface of a natura boulder, near the museum. It is in Pallava- Grantha alphabet of 7th century AD. This narrates that the pallava king Mahamalla Narasimha of Kanchipuram, of the Bharadvaja- Gotra had occupied vatapi. Chalukya king regained their territory in 655 AD and gave maximum encouragement to the revival of art and architecture. The queens of Vinayaditya and vijayaditya got beautiful temples constructed at Pattadakkal. In course of time king Vikramaditya-II (733-744 AD) too attacked Kanchipuram in 738 AD and got a victory inscription carved on a pillar in the Kailasanatha temple in Kannada language. This political conflict with the pallavas had a positive effect on the exchange of architectural and sculptural style. 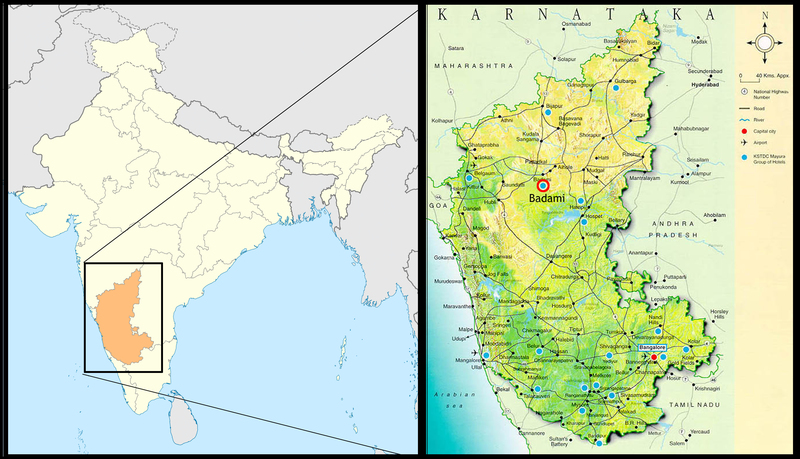 After ruling for nearly two centuries the Badami Chalukya monarchs succumbed to the newly emerged power of the Rashtrakuta dynasty (757 AD), when Kritivarman-II was overthrown by Rashtrakutas lasted till 973 AD and during the period between 757 AD and 973 AD, the Chalukyas lingered on to power in a feudatory capacity in different parts of the Rashtrakuta empire. In 973 AD Taila- II, a Chalukyan prince who was ruling over the portions of Bijapur district took advantage of the weak rule of Kakkala the younger brother of Krishna-III killed him and occupied the throne putting an end to 220 years old rule of the Rashtrakutas. After the Rashtrakutas, the region came under the rule of the Chalukyas of Kalyana, Sevunas, Yadavas, Vijayanagara king and Marathas and finally was captured by Britishers.